This sickening image from a fatal motorbike accident has been released by the Chinese government to highlight a road safety campaign. The country has one of the highest death rates from traffic accidents in the world with around 20,000 fatalities every year. This photograph shows a man called Hu Mou and his wife being sent flying through the air after their tricycle bike hit a car. They had ignored a red traffic light at the junction. 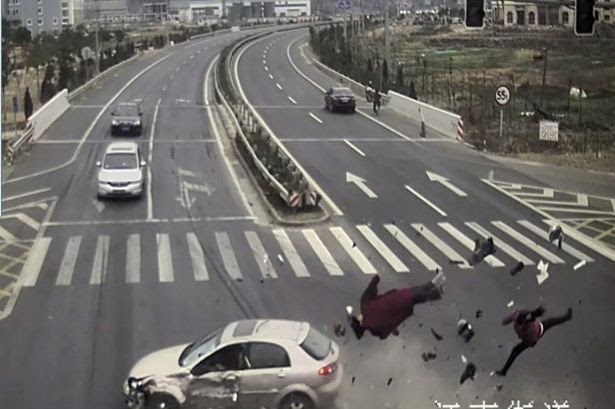 Both were killed in the accident which happened on February 5 in Linhai, in China's eastern Zhejiang province. Authorities hope releasing the image will shock people into taking better care on the road.